But in my opinion as a writer myself that sounds like an extremely bold claim – especially since they’re promising that anybody can do it even without any previous writing experience whatsoever… So what’s the truth? 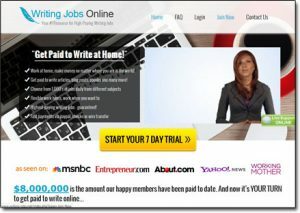 Is it really legit & can you truly get access to high-paying writing jobs like they claim or is Writing Jobs Online a scam that’ll just cost you more than you ever make? What Exactly Is Writing Jobs Online? At a glance it’s easy to be led into thinking that Writing Jobs Online is providing its members with writing jobs directly, so you might be expecting to simply sign up & start working immediately to begin making money right away but that’s not the case – even though they kinda make out like it is. The truth is that Writing Jobs Online is actually just an online directory & so after handing over your money all you’ll really be getting access to is links to other websites & some information which you can quite easily get elsewhere for free. So for what it actually is, in my opinion the website is VERY hyped up, and whilst you might be able to land a few jobs as a result of going through their directory – the chances of you earning anywhere near the income they boast on their homepage are very slim. And by the way I just want to point out here that whilst there are people online that hire writers, the reason they’re hiring writers is because they’re making money from the content… So if you’re interested in writing then rather than writing for other people I suggest you learn how to make money from your content yourself (that way you’ll earn more in the long run!). How Does Writing Jobs Online Work? Okay so in order to actually get access to Writing Jobs Online the first thing you’ll need to do is hand over some money. They offer a 7-day trial for $1 and then after the 7 days this will automatically renew each month for $27. But as well as that, as soon as you hand over the $1 you’re then immediately taken to another page where you’re promised lifetime access if you upgrade straight away for $27 so it looks like they’re also hoping people will jump on this offer too. In my opinion though it doesn’t matter what offer you take (even if it’s just the $1 offer), you’ll likely find yourself disappointed. The reason I say that is because not only is the information inside of Writing Jobs Online quite easy to find elsewhere for free, but I don’t think it lives anywhere near up to the hype that was boasted on the homepage. So What Do You Actually Get Inside? Initially when you land inside of the Writing Jobs Online platform you’ll be presented with a Getting Started section & this basically consists of an eBook which runs over the whole process of finding writing gigs & becoming a freelancer that writes for companies online. Hint: BKA Content & Textbroker are some of the companies recommended in this section. As the name suggests this is their database of so-called “jobs” but the truth is there aren’t actually any real jobs as such listed in here. Instead it just lists sites like Freelancer & Elance through which you can bid on projects in an attempt to get selected – so essentially they’re just gigs, not jobs. The downside to this is that in order to get selected (especially if you’re new) your goal will be to bid the lowest amount, so you can often find yourself working long hours for very little reward. In my opinion the easiest site to get started with for writing “gigs” from their list is probably Fiverr – in fact I do actually know of quite a few people who’ve found great success through writing for clients on Fiverr & they highly recommend it so it’s certainly worth checking out at least. On the Writing Jobs Online homepage you were promised that you’d be getting access to some jobs that pay a whopping $50 to $100 per article & whilst I was suspecting that this was going to be a total lie, Writing Jobs Online do kinda “half” deliver on their promise. I mean firstly I must stress they’re not actual “jobs” as such just like I mentioned in the previous section, but basically you’ll be getting access to a list of sites that pay between $50 & $100 per article. The important thing to point out here though is that as you can imagine these articles have to be very long & very thorough, so whilst $100 for an article might seem nice in reality you might see yourself spending a full week putting it together. On top of that none of these are guaranteed either – you’ll have to be selected by the website’s owner and as you can imagine there will be a LOT of competition due to the high payments being offered. Exactly the same as above but in this instance the sites pay between $100 and $200 per article. Again though the hours (or days) spent putting the articles together due to the strict requirements may make the seemingly great payment not so great after all. If magazine writing is more your style then in this section of Writing Jobs Online you’ll find a list of magazine publications that from time to time pay for content. Again though, no guaranteed work here. This is a bit of a weird section because rather than being targeted towards writers in general it’s actually targeted towards blog owners. It basically consists of tools that you can add to your blog like the tools I’ve listed in the “Tools I Use” section of my site here. If you don’t have a blog it won’t really help (or apply) to you at all. But in the same breath if you don’t have a blog you should definitely start one & you can learn how to do so 100% free by clicking here. Nothing exciting in here, just a list of pieces of software like Microsoft Word, Google Docs etc that you can use to write (and spellcheck) etc. The videos in this section aren’t too exciting they just basically show you how to sign up with the sites that they recommend & how you can navigate them. They show you this because they earn commissions from a lot of sites they refer to you so they want to make sure you sign up without hiccups (so that they can make themselves some more money). This is where the meat & bones of the course is supposed to lie but in reality it’s just a copied version of a site called Just Jobs. Be wary though, some of the jobs listed (like Writing To Wealth) are flat-out scams. Whilst it sounds like this section may provide you with opportunities to write news articles, it doesn’t – instead it just links to articles on other websites that discuss freelance writing. It’s supposed to essentially be “news in the writing world” but it looks like all of the links are auto-generated so in my opinion it’s not really overly engaging or useful. On top of just providing writing-related income opportunities the creators of Writing Jobs Online have also listed a bunch of other extra income opportunities such as paid surveys & Get-Paid-To websites inside of their members area as well. The question is though, if their writing jobs are so great & can truly help people make so much money like they claim then why have they felt the need to add in these “extra earners” as well? Clearly they’re not so confident in the writing advice/jobs they’re giving out. 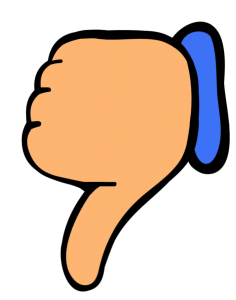 My Verdict – Is Writing Jobs Online a Scam? Nope, it’s not a scam as such – I think that would be an overly harsh verdict to arrive at – however in the same breath it’s also (in my opinion) nowhere near as great as it seems & you might not make any money at all as a result of purchasing it. Plus like I said several times throughout this review most of the information that’s found inside of the Writing Jobs Online members area can actually be quite easily found elsewhere online for free. It seems to me that rather than being set out to truly help people earn money, the creator of Writing Jobs Online seems to be more focused on helping himself make money at the expense of others instead. I mean sure, there is some fairly good links inside but the whole thing is just way overhyped & the claims made on the homepage of the site in my opinion are just totally unrealistic, especially if you’re new. So for those reasons despite it being “technically” legit I won’t be recommending the Writing Jobs Online program & instead if you truly want to make good money by writing then I urge you to learn how to make money from your own content rather than selling it to others. That is the most profitable option and it’s something you can learn for free at Wealthy Affiliate. But don’t forget there are also several other ways you can earn good money aside from writing too which you can see here. Easy Retired Millionaire – Scam System or Legit? My Review Exposes How It Works! Affiliate Victory – Scam Busted? My Honest Review Exposes How It Actually Works!